The Voodoo Lab Digital Pedal Power Unit is a linear power supply designed for digital guitar pedal effects. This compact unit is perfect for small pedalboards and rack shelves but can also work well with larger boards to add more power if needed. Digital power adapters can often cause unwanted high frequency tones. The Digital Pedal Power is great at keeping sensitive and vintage pedals that are susceptible to noise down to a minimum. It does this by utilising its 4 isolated, filtered and regulated outputs sections and its analog supply. This professional standard digital power supply is the perfect accessory to accompany your electric guitar pedal collection, for a reasonable price. User manual attached as a PDF file. 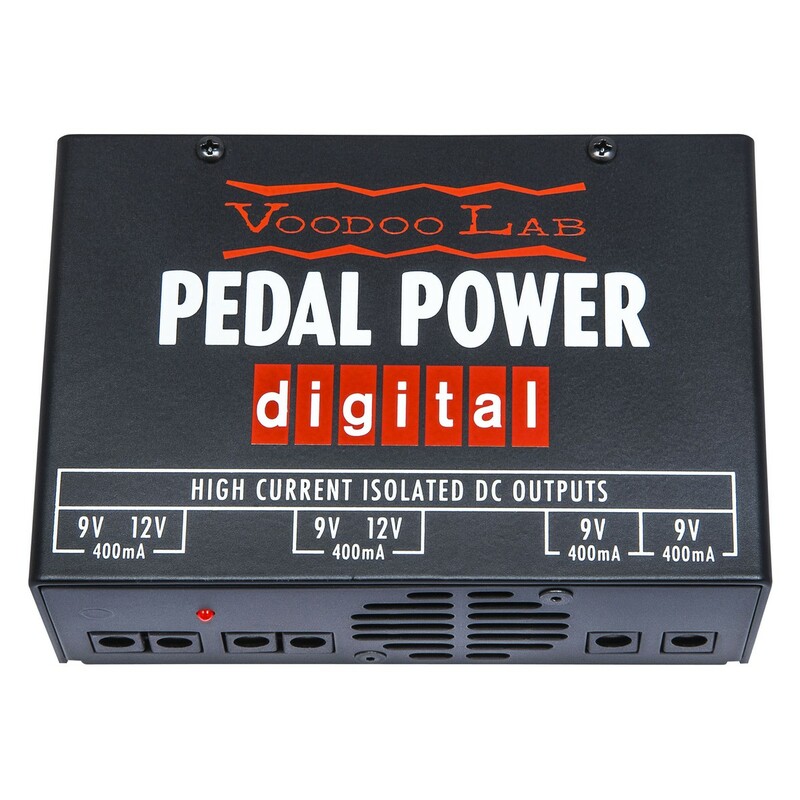 The Voodoo Lab Digital Power Supply has the capabilities to power up to 4 digital effects at once. These include Strymon, Eventide, Line 6, TC Electronic and others. This compact unit is perfect for small pedalboards and rack shelves but can also work well with larger boards to add more power if needed. The Voodoo Labs power supply can be taken onto the stage since it delivers constant and clean power, even in poor AC line conditions that often occur in live situations. The advantages of fully isolated output sections are that they eradicate ground loops and interactions that are not wanted between effects pedals, giving you low noise and a much better overall tone. All analog transformer-based power supplies generate heat. To combat this the Digital Pedal Power includes clever design features such as its temperature controlled variable speed fan, to stop internal temperatures from becoming too high, as this helps with long term reliability. The Digital Pedal Power is powered directly from the mains using the supplied standard AC line chord that can easily be replaced if lost or damaged. Note that the Pedal Power Unit is manufactured to operate from a specific supply voltage (100v, 120v or 240v) which is marked on the bottom of the unit. Using the wrong voltage has the potential to cause permanent damage. Please see the user manual PDF file for full safety information. For a capable digital power supply you can rely on in any situation, the Voodoo Labs Digital Pedal Power is the device to choose.